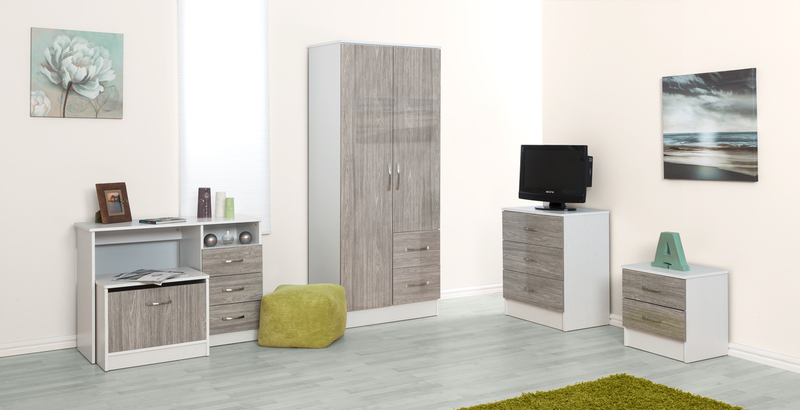 The 5 Piece set consist of 2 Door Combi Wardrobe, Chest of 3 Deep Drawers, 2 Drawer Bedside Cabinet, 3 Drawer Dressing Table Desk and Ottoman Storage Stool.The Marina combi wardrobe's exterior is finished with designer metal satin handles, and the inside is just as impressive... Divided into 2 sections, one side has a hanging rail and upper shelf, while the other door hides 1 further removable shelve and a second hanging rail, The wardrobe is very sturdy, each door is supported with 3 hinges, and good quality satin metal handles. Further the wardrobe has 2 additional color coded deep drawers for extra storage.Marina 3 drawer chest. It features color coded deep drawers with easy glide metal runners and central support for all drawers complimented with stylish satin metal handles. 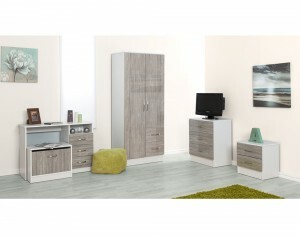 need I say more the 3rd piece in this range is the 2 drawer bedside cabinet, again with color coded interior, metal drawer runners, and stylish satin metal handles.Now the Marina bedroom suite includes 2 New recently introduced bedroom items the 3 drawer dressing table desk excellent for home studies with plenty storage accompanied by an ottoman storage stool.A beautiful free standing mirror comes as part of the Marina range. 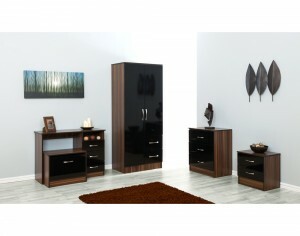 Carefully crafted with an attractive unique and refreshing look which will fit in anywhere in your home.